Hello and happy Monday everyone! I’m on the east coast this week hanging out with my in-laws in Savannah while Coco gets some love from the house sitter back home. We’re out here eating a lot of southern food and seeing all the sights, Tybee Island, downtown Savannah, Hilton Head, and then spending our evenings sipping cold drinks on the screened porch, I’m havin’ a great vacay! Before I left home, I cleaned off my desk because I prefer to come home to a clean surface. I made a few upgrades to the home office in the last six months, including a new rug, a smaller desk, a white leather chair, and some new curtains too. The space still has the same blue gray grasscloth wallpaper I installed a few years ago, so I was glad to finally find a great rug in the same palette to complement. I settled on a more petite desk in the hopes of avoiding the piles of papers that used to stack up. I found it at local interiors shop and love its “x” base. I also switched from working on a laptop to a desktop after I finally found a white monitor I liked (so hard to find for a PC!). 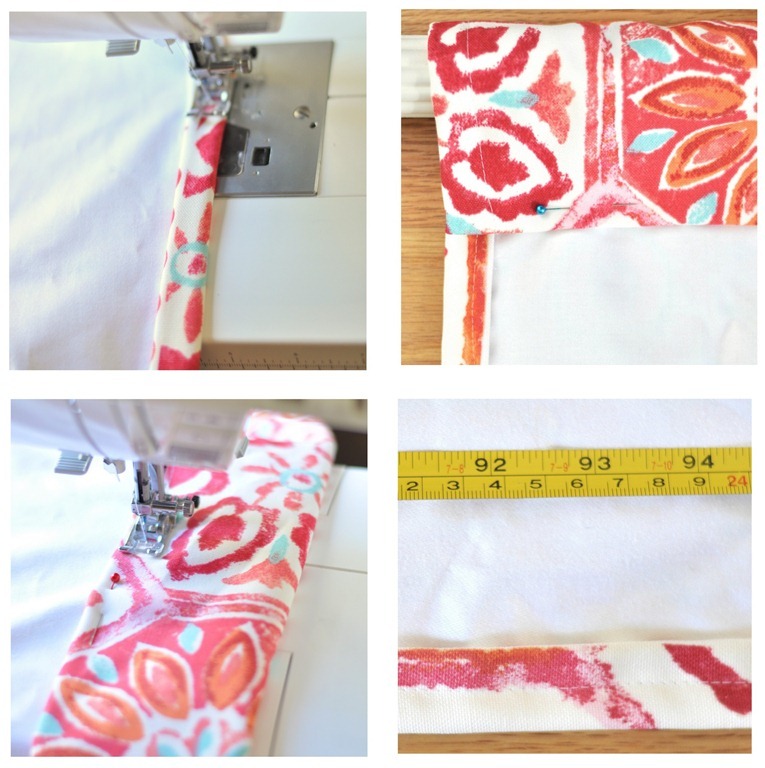 Those are the new rod pocket panels in a fresh feminine pattern by P. Kaufmann – here are the simple steps for making lined rod pocket panels for the home! 1) Cut the length of fabric you need plus an extra 6 inches for the rod pocket on top and an extra inch for the hem on the bottom. 2) Add a layer of basic fabric liner to the underside, pin together, then attach the liner to the length of both sides of the panel (image 1) by rolling under the raw edge and stitching them together. 3) Measure the height of the pocket with the rod inside (image 2) allowing plenty of room for the panels to slide back and forth and pin the pocket. 4) Sew the top rod pocket (image 3) wrapping the raw side of the fabric underneath for a clean edge. 5) Double check the proper height of the panel (image 4) mark the measurement and sew the bottom hem. That fabric just brightens my day and makes this space such a happy place to work. How true is it that we should surround ourselves with the colors and patterns we love most! *** Announcement! The ‘Fair Weather’ Link party scheduled for tomorrow (Tuesday) is postponed, I’ll announce the next round soon! I love the new curtains and desk, Kate. The curtains add a great pop of color! Have a blast in Savannah and Hilton Head, I love those two places. Hope your vaca continues to be relaxing and fabulous! how fun is that pop of color! so excited about haven- eeeeeeek! This fabric is perfect in your office! Great tutorial, too. I love panels–they’re so easy and always look classic. Enjoy your time in the south eating all of our wonderful foods and enjoying the warm water of the Atlantic. Thank you for the tutorial – I needed that. Kate, I thought your office couldn’t look any better but you managed to do it. I love the curtains and that rug is amazing! Thanks for sharing! Where did you get that fabulous rug!?!?! It is perfect! Hi Amanda, the link for the rug source is at the bottom of the post, there are several sizes available! Beautiful… That office would make me happy too. what a clean and bright office!! it’s such an inspiration…! now i want a white desk!! Love the fabric for the rod pocket curtains. Also love the rug . . . well, well . . . I must say, I love it all. I really like the love seat side bench and the pillow, yum! Very nice indeed! You do stunning make overs . . . Design . . .
Travel down south a bit, charming little walkabout town, St Simons Island . . . enjoy your vacation! Very fresh, and great use of color. I appreciate that you include your sources at the bottom. I was wondering if you could give the source for the rug you showed in your Troublesome Cat/Great Vacuum post? I asked, but I’m sure it got lost in the huge volume of replies. The colors and pattern are so beautiful. I am looking for a rug to anchor my living room–need to order a new sofa, but I’m reluctant to settle on the upholstery until I find a rug I love. Thanks! Hi Jenny, the blue transitional rug in my living room I found on clearance two years ago at World Market, sadly they don’t sell it anymore! So Pretty! I think I will move my work spot to your house! That’s one gorgeous home office you have there. I think you have the most wonderful office. I don’t know if I could wt much work done in there though!! I think I would be daydreaming and smiling too much!! I have that rug in my living room! Love it here, too! Can I just move in? I don’t even need a bed, I’ll just sleep on that gorgeous rug!! This whole room just makes me eternally happy. I LOVE the colors. Anything mixed with gray is WONDERFUL but this particular color is just *swoon*. Love. Hi Karen, the link for the monitor by Benq is at the bottom of the post! If only I could sew! These are gorgeous. I adore this room. I am obsessing over gray right now…I have a big five gallon bucket of pale gray for updating most of my downstairs! In our tv room we have an orange leather recliner that needs to stay…this demonstrates how nice orange can go with gray. THANKS! 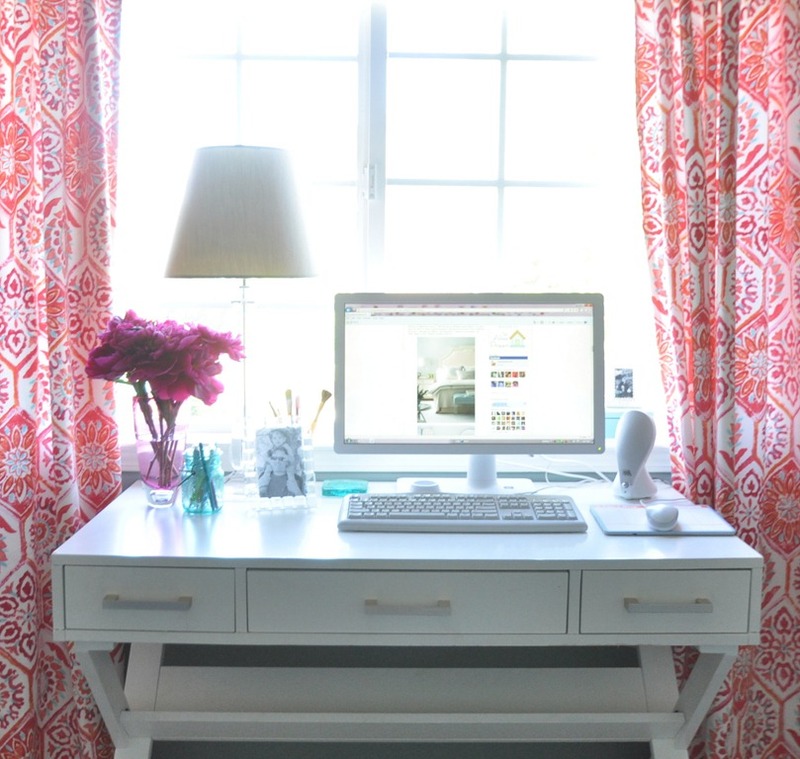 I absolutely love the desk and rug and the curtains add a great pop of colour. It’s all lovely. I’ve been eyeing that same chair – to use at my kitchen table. Wow I just LOVE your office! It’s so feminine and cheery yet calming at the same time! The perfect space to settle in and get some work done, so jealous! Its beautiful. Can you give me any info on the pillow? I think I remember a post about it, but can’t locate it now. I love your office. It looks like a nice retreat. Have fun here in the South this week with your family and enjoy all the good food! Greetings from Savannah! Visit Two Women and a Warehouse at it’s new location at Bull and Victory. You’ll have fun there! Thanks Carol, I also went to One Fish Two Fish, so lovely! I love what you’ve done with your office! I adore your desk and chair. Thanks for sharing! Your office is my inspiration! I love how bright and cheerful it is! Enjoy your trip….I love that area!!! Great desk! What did you do with the CPU from the desktop computer? What is the name of the P. Kaufmann fabric? It’s just what I’ve been looking for to put in my guest bedroom! Hi Liz, the fabric is “summer breeze” and there’s a link at the bottom of the post! Hi Kate! I LOVE your office. Just beautiful! Is the desk something that’s sold nationwide? I’m looking for a desk just about that size. We have to turn our office into a baby room, so I’m looking for a much smaller desk that can be squeezed into our hallway. This is the right size, but still stylish enough to not look out of place in a hallway. Hope you are well! Hi Erin, the desk is available online, I also saw it on Joss & Main a few months ago, so it must be available at Wayfair, check there! OMGOSH love the new office! I think you chose the perfect fabric for this room. Great turn out! Worth the wait! How much did the whole renovation cost ? Did you stay within your budget? Just gorgeous!!! I have a design dilemma and maybe Kate or one of you can help!!!! I plan on making a “home office” for myself in the back section of our L-shaped family room. I am “just-a-mom” but longing for organization and a place to call my own. I am loving the white/grey/pops of color look but I’d have to change the entire family room and that just isn’t happening…. Here’s what’s in the room now: Shaker Beige on the walls (very willing to change though), Honey-pine stained hardwood floors throughout with the Pottery Barn Blue/Gold Adeline Rug in the larger part of the L, Straw-colored upholstered couch with blue/pink/gold bouillon and fringe, dark leather side chair, gold – damask upholstered side chair, a stunning tall dark-cherry corner side piece, to name a few…. I need to buy a desk and chair… any favorites out there? How can I make it a calm and soothing area despite having so much color already in my family room. Thanks! Hi Christine, I’d go with a basic modern white desk in that corner, and use colors from the rug for your accents! Welcome to the South ! I’m just up the coast in Charleston and love reading your blog daily. Enjoy your visit. so calm but cheery! i’ve been eyeing that rug and many reviews said it’s much more blue than grey. could you share what you think? do the photos here look true to life? thanks! I came across your blog site today and I love it. I, too, did some renovations in my home office. The reveal will be on Friday’s post. Hopefully, you tune in to see it. I also re-designed my blog site. I’m totally loving it now. Love what you’ve done there. The color of the curtains is beautiful! I love those drapes. They provide such a bright burst of color! What a lovely bit of fresh color! Those curtains are such a great accent in your office space. Nice choice on fabric, and great job on the sewing! Have I mentioned that you were a great inspiration to me to begin sewing? For many years, I always told everyone that I have many talents, but sewing is definitely not one of them. I couldn’t even sew a button well. However, about a year ago, I decided that there were too many cute projects out there that required a sewing machine and sewing knowledge, so I decided to learn. I bought a basic (we’re talking $59) Brother sewing machine and did lots of reading online, and with those tools I have created clothing, stuffed animals, pillows, bags, fabric trays, and other items that I have gifted or used in my house. I am now in the process of sewing piping for a chair that I’m almost done reupholstering. So thank you for providing inspiration and encouragement in many of your posts! I love being able to sew, and I find my skills increasing all the time! I like the new colors you’ve introduced into your office! Hey, I have that rug in my living room! :) Nice choice! I love this space… thanks for sharing! I LOVE the rug!! Where is it from?!?!? Your new curtains are absolutely yummy, great choice of desk, thanks for sharing your office changes with us, it is very inspiring and very fresh and young looking. Love the desk!! Can you tell me the color of your wall? ha ha, I’m laughing at myself because I’m tired and came to your blog and thought “oh, so cute, I am going to add it to my Google Reader” and then realized you are ON my Google Reader and I clicked over from there ;) With that said, I LOVE IT!!! Love it! The rug is really cute too, where did that come from? oh boy, and I asked a question you all ready answered…don’t mind me…hum de dum! 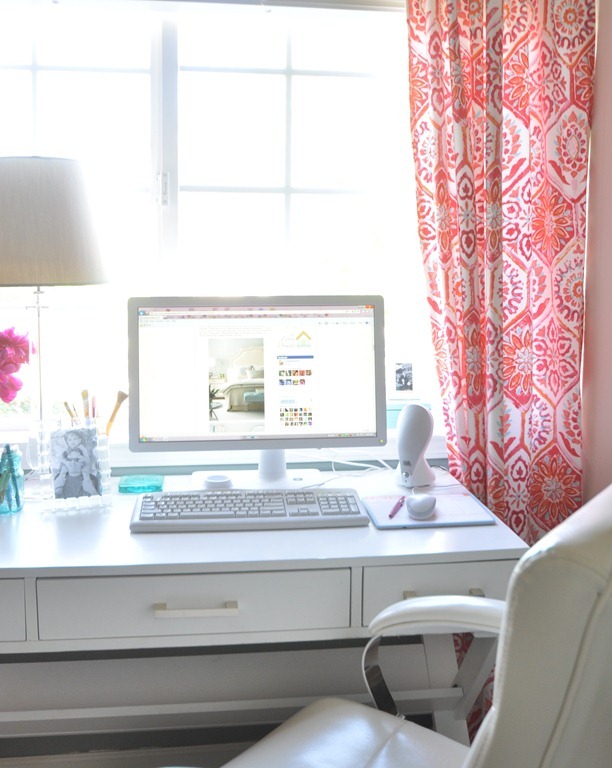 So pretty–I love the desk with the 3 slender drawers, and that white monitor is lovely! You are right–you need a place that makes you happy when you sit down to write creative posts–this is a great spot to do just that. Can you pretty please find out what color she has on her walls? Its my dream color. Love the whole look — very nice! Could you tell me the name of the Kaufmann fabric you used for the curtains? Thanks! Love your blog and your interest! Thanks for all the great ideas! LOVE love love the fabric you chose for the panels! All of my favorite colors all together! What a beautiful space. Can you tell us where you got that great desk? Also, I couldn’t find any white desk chairs on the Staples website. Did you buy it in the store? Thanks! Yes in the Staples store Louise ! Love your office, especially all the light from the big window. My office is in my basement, wish it could have a window like yours. Great desk. I love your office! What a great space to come home to! Beautiful!!! Hi Jessica, the paint color above the window and along the back of the bookcases (not shown) is ‘Seafoam Storm’ by Valspar. I must have that rug! When do we get details on where you got it? The room looks amazing! That fabric is just perfect. Love the little shots of turquoise! It’s one of my faxorite color combos right now! Also WHERE did you find the rug?! It’s truly gorgeous! I also meant to mention that I laughed when I learned you converted back to a desk top, when you found a white monitor! It IS a beauty! Hi Jessica, this will take you to the source of the desk! Really nice. Love the colors. Hi. I am in love with that both happy and serene space. What color paint do you have on the pocket/FBI-fold doors? I have been looking through all office blogs. Can’t find. Please. We paint tomorrow! You have fantastic clean, ssophisticated “California Traditional boho” taste. Most amazing that you do it all. Are you jeannie in the bottle? One more question, what are the dimensions of your space? Do you still have blue sideboard? I love that! Hello! I’ve been a silent visitor for quite a while now, but when I saw the rug, I knew it was time to speak up! Love the curtains by the way! Hi Ashley, it’s thicker and more plush than a cotton rug for sure, and soft underfoot. I’ll guess it’s an inch tall in thickness? It looks AH-MAZING!!!! I adore that rug! and the curtains are beautiful! Of course I would expect nothing less – your style is fabulous. How pretty, everything looks lovely! I’ve been wanting to make my own panels for awhile now, cannot find any I like really. I have been looking for a white desk, so after reading yesterday about your new desk I got in the car and ran to Staples. No luck! Can you give me the style number so I can ask the store manager to help me locate. Also what are the measurements? I have just bought a sewing machine so going to make the pillows, your a great inspiration…. What a VERY PRETTY curtain panels .. magically brings a warm cheerfulness to the cool colors in the gorgeous room. p.s. I LOVE the white monitor too!!! :) HAVE FUN in the East coast! Welcome to Atlanta! Hope you have a wonderful time while you are here. The panels are such a pretty color and the wall color in this room is perfect for seasonal changes. Your design is fabulous I would love to work in this room. Every inch of this is stunning, Kate! Wish I were going to be there to meet you at Haven. =( Have fun! I love your office and the changes you’ve made are fab! I am so in love with your curtain fabric! Thanks for the great and easy tutorial! Where did you buy that fabric? Hi Crystal, the fabric link is at the bottom of the post ! So did you say where you got that fabulous rug? I must have it!!! Love your entire room, I’m feeling very inspired right now, thanks for posting!! I love those curtains that you made. The bright color looks terrific with the gray walls and the white furniture. These pictures are so inspirational. They make me really want to redo my office too! can you recommend a good master bedroom color that is light, neutral and airy? i have dark wood furniture and two big windows. can’t seem to find a color that is just right! I’d have to see the space Amy but I think soft gray is perfect in a master bedroom! The rug is on overstock.com. Yes, I love it too!!!!! Please tell us where you got that rug!! I have been looking for one to match my grey walls. Love the office makeover! I’m also obsessed with the bird throw pillow that’s seen off to the side. Can you share where you found it? So cute! Would love to know where you found a white keyboard too. Maybe they’re more available now but last year when I found my white monitor (love) to match my white desk I haven’t been able to find a white keyboard. Thanks. Sorry. Guess they’re more available now; just found several. Thanks for showing. Love the room. Love the rug! Where did u get it? Did anyone find out the information about the rug? Its beautiful! Hi Jen, the link to the rug is at the bottom! What is the name of the fabric that the pillow is made out of? I love it! Fabric source link at the bottom Tiff! Love this room! Could you please tell me where u found your bookcases?? I have a similar big window in my extra room and would love to flank it with narrow bookcases but all the ones I find seem to be too wide. Thanks so much!! Hi Kiki, those bookcases were found at a store closing sale years ago, sadly they’re not available at any retailer. Where did you find that desk? Hi Kathy, there’s a link to the desk at the bottom of the post! Do you think Ana White homemaker could create plans based on your photos of the bookcases in your office that sits on the side of your desk and holds your computer? I would love to build these. She might Elaine, Ana is wonderful like that – send her an email! Looks great! Can you tell me where you found the monitor? I didn’t see the link to the desk, but I’m pretty sure I found it on Sears’ website. Just wondering if you felt it was worth the money? It looks like exactly the desk I want, but I usually don’t like buying furniture without seeing it. Would you recommend it? Thanks! Hi Andrea, not sure if it’s the same desk you see on Sears but I do love mine – it’s definitely a petite desk but I love the style! whoops, found the link! but still would like to know your opinion! thanks! i love the gray walls! what brand and color is it? I can’t seem to find the link to the desk either; can someone help me out? the desk is available here Tiffany! Hi, can you tell me the curtain fabric name or post the link? I read it’s by P.Kauffman but I can’t find that pattern anywhere online. The link at the bottom of the post will take you to it Jessica! I feel silly now….after spending so much time on this post I just now found the “source” links ;) thank you! Loving your blog!! I had a new desk made recently however I was forced to stain it because we used pine with ALOT of character, so white paint was out of the question. The stain color I chose was a mahogany. Since I’m in love with the color palette you chose, I plan to order the same fabric to make my curtain panels. In your opinion do you think the mahogany desk will look okay up against this fabric? Please tell me the name of the fabric used for the curtains. I love them! They would be perfect for my daughters new room!! Hi Traci, there’s a link to the fabric at the bottom of the post! I love the white leather chair! Can you tell me where you purchased it or post the link? Hi Jackie, the chair is in the Staples store but I don’t see it online. Aww okay thanks for checking. Do you by chance remember the name of the chair or who it’s by maybe they sell it somewhere else? Awww okay thanks for checking! Do you by chance know who makes the chair or the name of it? Maybe I can find it somewhere else? I looked back through the comments to see if you sourced the bookshelves. Can’t find it anywhere. Would you share? I love that they are lighted. Hi CB, I picked up those bookshelves at a store that went out of business a few years ago…. I am about to re-do one of our guest bedrooms & I’d love to paint the closet as you did in your office. Can you please tell us how you figured out the color combos & how you did it? I’m assuming you just taped it off, but did you use the wall color on some of the doors & then a diluted wall color on the other parts? I would really appreciate an explanation of how to get the correct color coordination on the doors like you have so they blend in more & don’t stick out. Thanks! HI CMM I used a combination of the wall color and white paint and taped off the doors with paint just like you said! How much fabric did you order for the curtains? Love the room! 3 yards per panel Kristine. I think I saw a desk like that or similar design on Pottery Barn website(I think!) Love it, would I be asking too much to give us the measurement of the table? I also love your curtains. They add class to your room. I love your color scheme; elegant yet soft to the eye. I know with a laptop, you wouldn’t have all the cables,etc.showing but you choose to have a monitor? I’m computer challenged, so bear with me about computer questions. Where do you have your desktop hooked up so the cables don’t show? I am hoping you’ll be able to help – the source link for your curtains is not linking to the fabric any more. I know it’s by P. Kaufmann but I’m hoping you remember the name of the fabric so I can source it on another site since fabric.com doesn’t seem to carry it any more. Thanks!